Are you in the market for a new roof and want to gain the most return for your investment? Elastomeric roof coating systems deliver a newly restored, watertight roofing membrane with added protective surfacing without a costly tear-off. Elastomeric coatings provide surface protection from bad weather, ultraviolet (UV) rays, mechanical and foot traffic protection, and fire. Extreme weather conditions, such as hail, strong winds, and heavy rain can cause damage to one’s roof. Several of National Coatings’ AcryShield elastomeric coatings can provide protection from these elements. These roof coatings are proven to withstand Factory Mutual’s (FM Approval) Class 1-990 wind uplift test and Class 1-SH for hail damage. For more information on this report, click here: FM Approval Report. Protection against UV rays is extremely important because the sun’s damaging rays are the leading cause of roof failure. The constant heat radiating on the roof from the sun causes the roof to dry out and become brittle. Installing a highly reflective elastomeric coating to the surface of your roof will provide you with lower roof maintenance and will extend the lifespan of your roof. The Cool Roof Rating Council (CRRC) conducts initial and aged (3-year) ratings to provide an unbiased directory of roofing products that have been tested for solar reflectance, thermal emittance and SRI Value. Click here to see all of National Coatings’ highly reflective coatings: CRRC Report. Mechanical and foot traffic protection is important when needing to install or service roofing equipment or service the rooftop itself. A durable, elastomeric coating with high levels of elongation and tensile strength will provide exceptional protection against foot traffic and physical abuse. 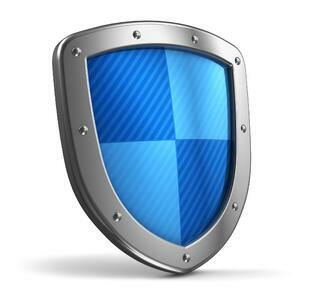 Our AcryShield A550 coating can provide protection up to three times the amount of a typical roof coating. Lastly, protection from fire is important as your roof is part of the building envelope and must provide protection on the uppermost part of the building from fire hazards. The California Department of Forestry & Fire Protection Office of the State Fire Marshal Fire Engineering – Building Materials Listing Program can help you identify weather a roofing material is fire resistant or not. Click here for National Coatings’: Fire Report. For more information on elastomeric coatings and their benefits, download our Free Guide to Coatings. PVC or polyvinyl chloride is a common roofing material because it is an inexpensive option that is exceptionally pliable and easy to install. Over time all roofing substrates age and deteriorate, PVC is no exception. When PVC ages it becomes brittle and shrinks, losing its ability to remain flexible causing tearing and rips along the seams, eventually leading to leaks. Elastomeric roof coating systems are ideal for the restoration of PVC because they allow you to restore your aging roof to new without the need to complete a traditional roof tear-off. Roof tear-offs are expensive. They require business closures, lengthened installation time, disruptive installation to tenants, additional labor and material costs and extra unnecessary landfill waste – harmful to the environment. If you can avoid a roof-tear off, it will save you a great amount of time, money and hassle. Installing a PVC roof restoration system using AcryShield elastomeric coatings allow you to keep your business open during installation, as these systems are spray applied and creating minimal noise disruption to the buildings occupants, eliminating any noise from nailing, drilling, or seam welding. 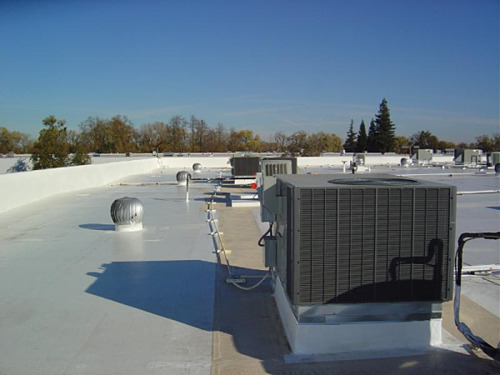 Also, these roof coatings contain zero to ultra low VOCs, eradicating harsh chemicals and smells to the surround areas. Elastomeric roof coating systems are easily and quickly installed, allowing your business to remain open and productive while the installation is occurring – saving the business owner a substantial amount of money avoiding any loss in production time. These PVC coating systems are extremely durable and have excellent adhesion to the PVC roofing substrate. 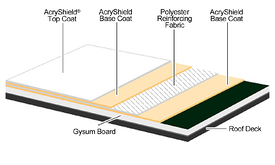 The AcryShield elastomeric base coat provide outstanding waterproofing, adhesion, and resistance to ponded water. The top coat provide superior UV protection, reflectivity, longevity and brightness. These coatings are formulated to reflect a majority of the sun’s heat, absorbing only a small amount into the structure, which allows the air temperature inside the building to remain cooler with less energy consumption throughout the day. This directly impacts your energy utility bill, lowering costs while increasing tenant productivity and comfort. There is no need to replace your aging PVC roof when you can restore it to new. National Coatings offers 10, 15 and 20 year warranties for restoring PVC roofing. If you would like additional information on our roof coating products and systems, download our FREE Product Brochure. 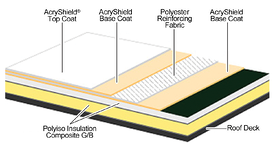 The AcryPly-D™ Deck-Up Systems for new construction delivers benefits that other roofing systems cannot. These systems are fully adhered, watertight and custom tailored to your buildings specific needs. These systems are available with either Foam Composite HCFC Free Polyisocyanurate Insulation or Gypsum Roof Board. Seamless – By eliminating joints, seams, and penetrations of your roofing system you avoid premature roof failures that occur due to the lack of flexibility that the roof membrane is able to provide under stress that usually occurs at its weakest point; the seams and penetrations. As your roof ages, it becomes more difficult to remain flexible and keep up with the building expanding and contracting during daily temperature fluctuations. This movement and lack of flexibility causes tension at the joints, seams, and penetrations, resulting in the membrane ripping and tearing, leading to water penetrating into the roof system and eventually into the building. AcryPly-D elastomeric roof coating systems are spray applied across the rooftop creating a seamless, monolithic membrane that is watertight. Exceptional Insulation R-Values and Possesses the Highest Per Inch Long-Term Thermal Resistance (LTTR) Values - The LTTR represents an advanced scientific method based on the consensus standard in the United States and Canada for providing test results with a 15-year time-weighted average LTTR. Therefore, this system’s thermal performance is proven to provide excellent protection against heat and cold transfer, superior energy efficiency and energy utility cost-savings. Superior Protection – The elastomeric roof coatings used in these systems provide durable waterproofing and weatherproofing with excellent UV blocking capabilities, allowing your roof to last longer and avoid pre-mature aging. The AcryPly-D systems have exceptional fire and thermal barrier ratings along with excellent wind uplift resistance. The base coats provide outstanding adhesion and resistance to ponding water with finish coats that exhibit high resistance to dirt pick up,, while providing longevity, brightness and protection against biological attack such as algae and mold. Cool Roof – A cool roof provides the ability to reflect a majority of the sun’s heat away from the building, while absorbing only a minimal amount. Not only does this allow the AcryPly-D System to protect your roof against UV degradation and premature aging, it also allows the building to remain cooler in temperature while using the air-conditioning unit less. As you can imagine, this saves a tremendous amount of energy usage and cost throughout the year while providing cooler temperatures that the roof top equipment has to perform under. For more information on our AcryPly-D Deck Up Systems, New Construction Systems or other elastomeric roof coating systems, download our FREE Product and Application Brochure!